JERUSALEM – Hamas, desperate over its increasingly precarious situation in Gaza and eager to please Iranian paymasters, has escalated the premeditated, openly violent campaign aimed at breaching the Israel-Gaza border and attacking nearby Israeli communities. This while the news media hypes Hamas-provided casualty counts and portrays the Gaza rioters as peaceful protesters frustrated that there is no Palestinian state and angry that the U.S. moved its embassy to Jerusalem. In doing so, the news media are actually advancing Hamas’s cause. Hamas organized today’s massive escalation to coincide with the official opening ceremony of the U.S. embassy in Jerusalem and the Palestinians’ commemoration tomorrow of so-called Nakba Day, which mourns the “catastrophe” of Israel’s founding. 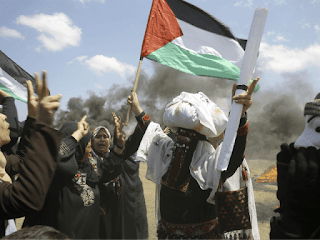 Hamas has been selling the nearly two-month-long mass riots as “return rallies,” marketing the fiction that Palestinians have a so-called “right of return” to the State of Israel while also demanding a state immediately. It is outrageous to claim that the Palestinians would need to resort to such actions in order to create a state. The Palestinians have infamously turned down every Israeli statehood offer, each those that came with a shared capital in Jerusalem. Those offers were made at Camp David in 2000, Taba in 2001, the Annapolis Conference in 2007, and more offers were made in 2008 and reportedly in 2014. In each of these cases, the PA refused generous Israeli offers of statehood and bolted negotiations without counteroffers. Only today, Prime Minister Benjamin Netanyahu yet again called on the Palestinians to return to the negotiating table. The only thing standing in the way of the Palestinians having a state — even one with a foothold in Jerusalem — is the Palestinians’ own abject refusal to accept numerous statehood offers while rejecting Israel’s very existence. Meanwhile, the Hamas-run health ministry in Gaza claims that so far 52 Palestinians were killed and some 1,200 more wounded in today’s riots at 12 locations along the border. The casualty numbers, which are expected to rise, could not be immediately verified. Hamas has a history of exaggerating casualty claims. The news media has been brandishing the Hamas-provided numbers, just as they did with other recent Gaza riots. This while failing to provide the proper context for today’s bloody events and how Hamas is singularly responsible for leading its people to death. A closer look at today’s casualties betrays the violent nature of the allegedly peaceful protests. Three Gazans were shot while trying to plant explosive devices at the border fence, while others were killed attempting to open fire on Israeli soldiers, the IDF said. Israel already identified at least 10 of the fatalities as Hamas members.